Hello, dosto kya aap facebook vip account banane ke bare me soch rahe hai to is post ko jarur read kare. Aap logo ne kayi logo ki facebook profile dikhi hogi uske samane aapne dekha hoga ki unki profile VIP hoti hai. Unke profile ke samane Facebook VIP Account, Official Profile @2016. Aam taur par VIP matlab hota hai, very important person to hum sochane lagate ki kash hum bhi yesi profile bana paye. To chaliye is post me mai aapko bataunga ki kaise hum facebook ki profile ko VIP banaye. Niche di gayi step ko follow kare aur bus 2 minutes me apna VIP account bana le aur apne frineds ko impress kare. 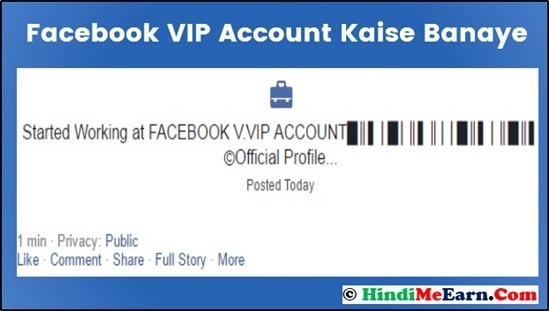 Facebook VIP Account Kaise Banaye? Sabse pahale apne facebook account me log in karle. Ab apne profile pe click kare. Ab profile me jakar edit work details par click karana hai. Ab aapke samane ek search box aayega usme aapke ye dalana hai, Facebook VIP Account, Official Profile @2016 hai aur search karana hai. Ab aapke samane niche bahut se profile dikhayi denge unme se ek select kare. Ab select karane ke bad postion me kuch bhi likhe jaise Engineer, Owner, Developer aur submit kar de. Ab aapka VIP account taiyaar hai. Ab apne friend’s ke sath isko share kare aur apne dosto ko impress kare. Facebook pe real me koi VIP Account nahi hota hai, sabhi ka normal account hi hota hai. Lekin logo ne workplace ki jagah Facebook VIP profile dalkar usko VIP bana diya hai. Yesa har koi bhi user kar sakata hai kayi log yesa sochae hoge ki vip account sirf vip logo ke liye hi hai, lekin real me yesa kuch bhi nahi hai ye sirf enjoyment ke liye logo ne banaya hai. Unwanted tag se kaise bache? Agar aapko ye post pasand aayi ho to apne dosto ke sath jarur share kare taki aapke dost bhi VIP Account banana sikh jaye.